Bob “Rapid Robert” Feller played his entire baseball career of 18 years for the Cleveland Indians. He holds the record for the most wins of any Cleveland Indian with 266. He led the American League in strikeouts seven times and amassed a total 2,581 strikeouts over his career. 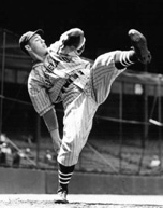 In 1946, Feller set a record in the modern era of baseball with 348 strikeouts in a season. He pitched three no-hit games; shares the major league record with 12 one-hitters; and, was the only pitcher to throw a complete game no-hitter on Opening Day (April 16, 1940). Feller was the first pitcher to win 20 or more games before the age of 21. In 1947, when he was 23 years-old and had 107 wins, Bob enlisted in the Navy to fight in WWII. In his first two full seasons back from the armed service (1945 and 1946), he won 26 and 20 games, respectively. He was elected to the Baseball Hall of Fame in 1962, his first year of eligibility. Bob discusses Babe Ruth’s baseball-playing abilities, as well as his impact on baseball. Bob recounts his first time actually meeting the Babe. Bob tells the story of when Babe Ruth came to Des Moines, Iowa for one of his barnstorming games. Bob talks about some his favorite baseball-playing memories.